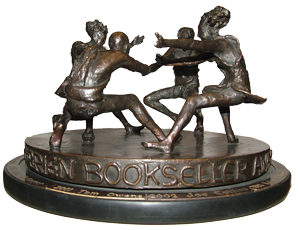 The O'Brien Bookseller of the Year Award has been presented annually since 1995 in recognition of outstanding achievement or an invaluable contribution to the book trade by an individual bookseller. The Elements, a bronze perpetual trophy sculpted by Rowan Gillespie, one of Ireland's leading sculptors. The winner also receives a framed commemorative certificate. 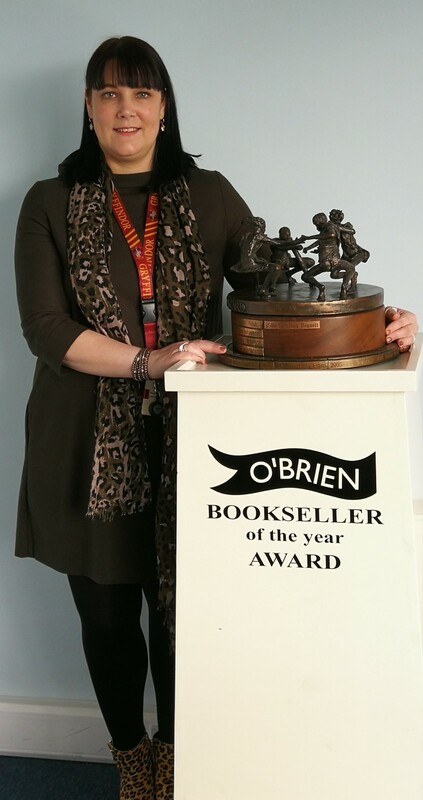 Caitríona Bennett of Argosy books was declared winner of the 2019 Bookseller of the Year award at the Booksellers Association annual dinner on Friday 8 March 2019. Over twenty years in the book trade, this bookseller has built a huge knowledge of what will sell and where. Always kind and welcoming, she is an essential part of Ireland’s book community. Consistently professional and creative in an ever-changing environment, she is the embodiment of bookselling passion and dedication. Listening to Ivan read out the citation for the award on Friday last was an interesting moment. I was thinking twenty years in the book trade was a pretty good stretch and did not recognise myself in the description. I was so surprised and delighted to hear my name being called out that it took my brain a second or two to catch up. I got my start with Hughes & Hughes as a bookseller, then did two years with a publishing company before I moved to Argosy Books sixteen years ago. It was a much smaller set up then but over the years it has gone from strength to strength - building relationships with customers and publishers alike. I would like to feel I have played a part in this in my time with Argosy. I have always worked with dedicated, positive people in a business I love and enjoy and the twenty years have flown by. It is an ever changing trade and I enjoy the challenges this presents as we all work to keep the amazing books we sell getting to the readers.I am very grateful to all the people I have met and worked with in the last twenty years as I have learned a lot about every aspect of the business in this time. (While this makes it sounds like I am retiring, I am far from it!) The fact that it has been entertaining and fun along the way makes it a bonus. I really appreciate the award and am happy to join the long list of previous worthy winners. Thanks to the judges and all at O'Brien Press for what I consider an honour. Congratulations to Caitríona on her hugely popular win. 1996 Sally Mimnagh, Eason & Son, O'Connell St.